There is a long-standing tradition of textile archiving and design history research at the University of Leeds, including early associations with notable scholars such as Lewis Foreman Day and Flinders Petrie. This outlook has been sustained by our dedicated archives at ULITA – An Archive of International Textiles. Research underpins all cataloguing, exhibitions and publications as well as associated workshops. One of our key research findings in recent years is that different cultures have different geometrical preferences, expressed through their visual arts; such a perspective requires a detailed knowledge of the underlying processing technology as well as, in this case, an understanding of systems of geometric classification and comparison. 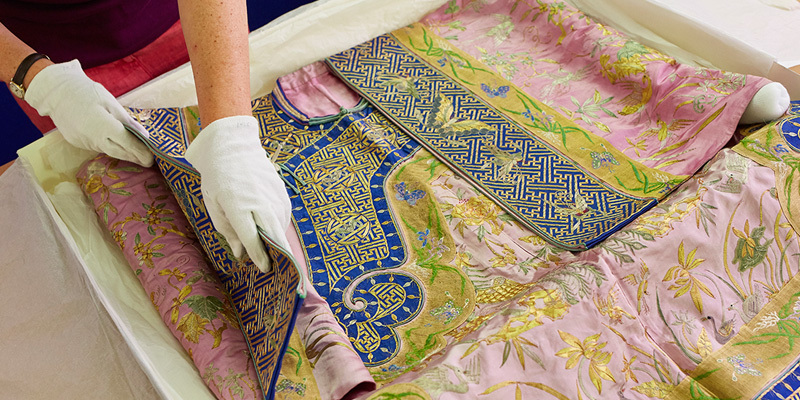 Textile-heritage research at the University of Leeds has informed and improved public awareness and understanding of textile heritages among target audiences, especially school children, community groups, volunteers, interns and teachers. Through hands-on workshops, conventional publications, talks and lectures, a strong website presence and public exhibitions, the research has engaged and inspired audiences and has underpinned a ‘best practice’ resource for other museums and archives. Our research impact is demonstrated through direct feedback from workshop participants, evidence of community engagement, commentary in the visitors’ book, website hits, and also from accreditations, awards and endorsements from key national arts organisations in recognition of initiatives enhancing public appreciation of textile heritage.